Click the switch to close or open it. The resistance of the rheostat and the inductance of the inductor are capable to be varied by dragging their sliders. After the switch is closed, two arrows appear above the inductor. The blue one represents the current in the circuit while the transient red one is the induced current caused by the inductor. 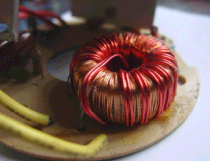 The polarities of the inductor are also shown in the conventinal colors: red(+), black(-). "Y-shift", "V/Div", "s/Div" are the common controls of a standard CRO. "Curve" is a special control. When it is selected, a continuous curve will be traced across the screen. The trace begins only when the switch is closed.